Michele Cardegna first appears at Painesville, Lake County, Ohio, in 1923. When he immigrated to the United States Painesville, Ohio, was his destination. In America Michele Cardegna was known Michael Cardina. Michele Cardegna, son of Giacomo Cardegna and Michelangela Fraraccio, was born on July 21, 1899, at Frosolone, Isernia Provice, Molise, Italy. He married Maria Donata Montanaro in 1920 at Italy. Maria Donata Montanaro was also born at Frosolone, Italy. Michele died on December 20, 1966, at Lake County Memorial Hospital, Painesville, Lake County, Ohio, at age 67. His body was interred at Riverside Cemetery at Painesville, Lake County, Ohio. Michele Cardegna first immigrated to the United States on December 3, 1923, at age 24. He was traveling to Painesville, Ohio, to join brother, Giovanni Cardegna. Michele Cardegna returned to Italy in 1926. Michele Cardegna is cited on a passenger ship manifest re-entering the United States on July 1, 1927, at age 27. He was travelling to Painesville, Lake County, Ohio. 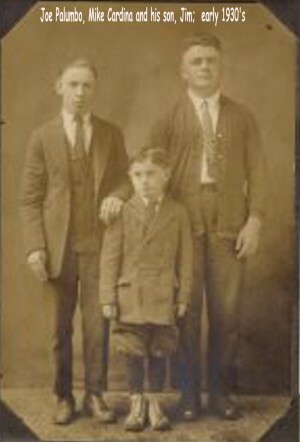 Michele was previously living at Painesville, Ohio, from 1923 to 1926. He arrived in the United States at the port of New York City aboard the ship SS Duilio. Michele Cardegna was enumerated for the 1930 Census of the United States, on May 6, 1930, living at 334 Sanford Street, Painesville, Lake County, Ohio, as a roomer of Giovanni D’Alessandro. Michele Cardegna was enumerated as Mike Cardina. 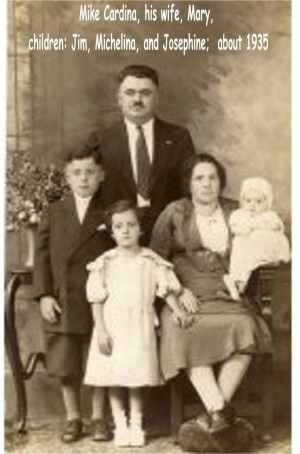 Michele Cardegna became a citizen of the United States in 1930. Michele resided at 344 Sanford Street, Painesville, Lake County, Ohio, when he was naturalized. Michele Cardegna is cited on a passenger ship manifest re-entering the United States on July 2, 1932, at age 32. He was travelling to Painesville, Lake County, Ohio. Michele was escorting wife and children to America. They arrived in the United States at the Port of New York City aboard the ship SS Conte Grande. Michele Cardegna was enumerated for the 1940 Census of the United States, on April 11, 1940, living at 250 Richmond Street, Painesville, Lake County, Ohio, as a head of household. Michele Cardegna was enumerated as Mike Cardina. Mr. Cardegna was retired from the Diamond Alkali Company. He was employed there from 1928 to 1963. 1. Giacomo Cardegna was born on March 20, 1922, at Frosolone, Italy. He married Norma Jean Neave, daughter of Theodore L. Neave and Dorothy Mae Stone. Giacomo died on May 5, 1986, at LakeEast Hospital, Painesville, Lake County, Ohio, at age 64. His body was interred at Mentor Cemetery at Mentor, Lake County, Ohio. 2. Michelina Cardegna was born on November 20, 1927, at Frosolone, Italy. Michelina died on December 20, 2003, at Andover Village Retirement Center, Andover, Ashtabula County, Ohio, at age 76. Her body was interred at Riverside Cemetery at Painesville, Lake County, Ohio. 3. Josephine Ann Cardina was born December 18, 1933, at Painesville, Lake County, Ohio. Josephine Ann died in 1990. Her body was interred at Riverside Cemetery at Painesville, Lake County, Ohio. 4. Nicholas Cardina was born on February 25, 1935, at Painesville, Lake County, Ohio. 5. Mary Ann Cardina was born on November 18, 1940, at Painesville, Lake County, Ohio. Mary Ann died on June 14, 1996, at Richmond Heights, Cuyahoga County, Ohio, at age 55.